Effective water supply is likely to emerge as one of the most urgent environmental issues for the twenty-first century. This column outlines commercial, governmental, and cross-national considerations surrounding water resource management, noting too the importance of culture in building sustainable water development. 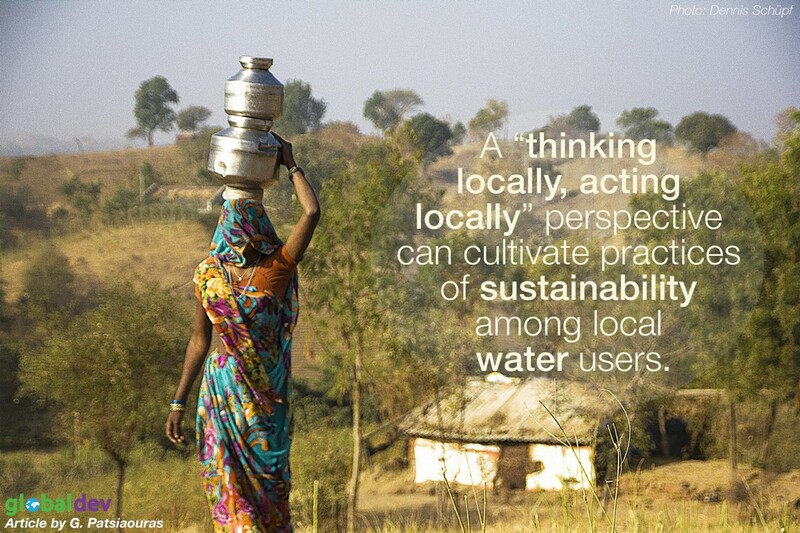 Co-operative and community-led alternatives cannot in themselves solve the catastrophic impact of water scarcity, but a “thinking locally, acting locally” perspective can cultivate practices of sustainability among local water users. On a planet where the amount of available freshwater constitutes less than 0.5% of all water, we need urgently to recognize that the availability of clean water per person is rapidly declining. River pollution, rising populations, wasteful irrigation, and water mismanagement, both nationally and individually, are key contributors to global water shortages (World Research Institute 2013). Today, nearly one billion people lack adequate access to clean drinking water and almost 40 developing and developed countries have declared a water drought status. Effective water supply is likely to emerge as one of the most urgent environmental issues for the twenty-first century, second only to global warming. Contrary to a common perception that water resources can be commercially exchanged only as consumer goods with branded bottles, there is diversity of water markets. For example, in 2005, Israel and Turkey signed agreements for the purchase and transfer of water resources. Although water transfer is not an economically viable process, water security in regions like the Middle East is dependent on the co-operation and exchange of trans-boundary water resources. There are also cross-national transfers of water in the Caribbean, the Canary Islands, and the Philippines. The continuing commercialization of water resources is leading to the removal of national and state policies that prevent export, pricing, and letting of water rights. Unfortunately, while elsewhere million tons of freshwater are commercially exchanged and used – for example, to irrigate golf courses – in sub-Saharan Africa, 43% of children drink contaminated water. One in five dies before the age of four. Approximately 70% of global water supplies are used in agriculture and by 2020, we will need almost 20% more water to continue producing crops and food to satisfy human nutritional needs. Water scarcity is expected to have an increasingly big impact on the growth of crops, the production of raw materials and the manufacturing of goods and services. Freshwater scarcity should not be associated exclusively with individual consumer demand and consumer needs related to thirst and personal hygiene, but also with the ‘consumption’ of embedded water by various institutions that galvanize and stimulate the global supply chain of food, services, and products. A growing body of research on ‘water footprint’ – the ecological impact of both the direct and indirect use of water by consumers, producers, businesses, or even countries – reveals some disturbing facts. For example, it takes 15 tonnes of water to produce a kilo of beef, about 6 tonnes for a pair of jeans and 13 and 25 litres of water to grow one tomato and one potato respectively. Technological competition among countries for water conservation through manufacturing of water-intensive food and material goods is increasing. Simultaneously, the economic evaluation of water-intensive imported and exported commodities creates a global map of tradable virtual water. An explicitly political consequence of the emerging scarcity of water can be identified in cross-national tensions between governments claiming access to the same river, lake, or basin. More than 260 river basins are shared by two or more countries, a fact which indicates that water scarcity might unfortunately become the platform for military conflict for access to clean water resources (World Water Council 2012). The efficiency and cooperation of global, national, or regional water markets depends heavily on the development of public policies that cultivate an ethos of fair distribution of water resources through ethical and sustainable provision systems. The intense debates on the management of natural resources have focused on binary and antithetical terms and views on water resource management, such as public versus private ownership, state versus market control, and equality versus efficiency in water provision. To a great extent, these debates have overshadowed the role and potential of community water management as a third alternative to both market and state failures. Despite the fact that the majority of governments around the word have chosen hybrid water supply and delivery models, we should not ignore the importance of culture and community in building sustainable water development. In Colombia, Kenya, Pakistan, and Sweden, along with many other countries, local water councils and community-owned water projects are playing an active role in developing sustainable, democratic, and eco-friendly small-scale systems of water provision. These co-operative and community-led alternatives cannot in themselves solve or reverse the catastrophic impact of water scarcity. Nevertheless, working in synergy with a “thinking globally, acting locally” agenda, these projects can highlight the fact that water scarcity is a changeable, non-linear and complex issue, which emerges in different forms and conditions around the world. Consequently, a “thinking locally, acting locally” perspective can capture and cultivate “micro-practices” of sustainability that can create awareness and active participation among local water users. This angle has the potential to revitalize a synergistic relationship between active government and community intervention practices towards fair water distribution, one that does not favour the consumer needs of wealthy water consumers and affluent city areas. Georgios Patsiaouras is a Lecturer in Marketing and Consumption at the School of Business, University of Leicester. He has a variety of research interests including sustainable consumption and water scarcity, conspicuous consumption and how macro-economic forces shape marketing activities.